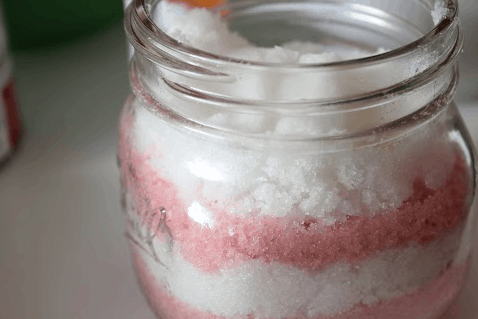 Check out our super fun Homemade Peppermint Sugar Scrub Recipe! Perfect for a homemade holiday gift too! We love our homemade scrubs. One of our most popular posts is our Mary Kay’s Satin Hands Copycat Sugar Scrub recipe! Another reader favorite is our homemade Brown Sugar Scrub Recipe too! We go crazy for homemade beauty products that we can make using ingredients found in our kitchens. If you have a remedy to share please leave a comment below and we may just feature your tip! Oh, and our #1 most favorite homemade beauty tip is our Cracked Heel Remedy! This recipe has been tried and tested by many readers and left with amazing results!! Check out that post! It’s a must read for sure! Now we have another that you are sure to love! 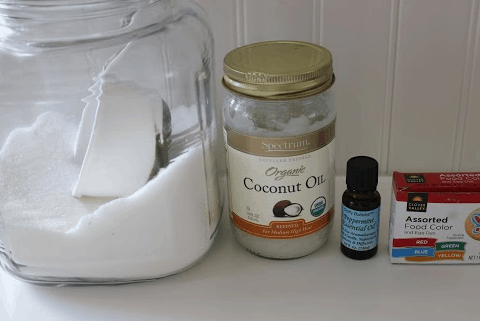 Try this homemade peppermint sugar scrub recipe for yourself! 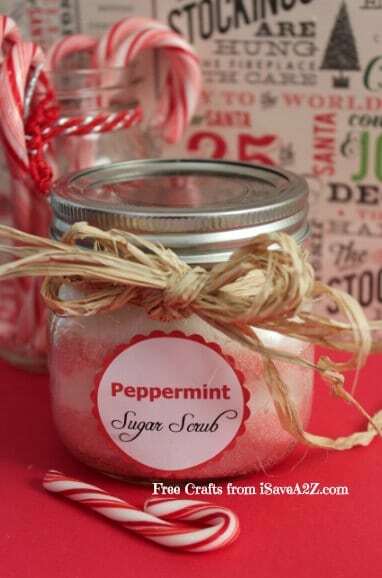 Plus download the Free Peppermint Sugar Scrub printable Labels here! It’s a fun and frugal gift giving idea. Optional: Add a tablespoon of Vegetable Glycerine for extra moisturizer. Glycerine is not easily found in stores so do yourself and favor and order it online. It will save you time and gas. Trust me. It makes your skin amazingly soft. By Jennifer on November 29, 2015 Crafts, Popular Posts. Can you eat this? I was wondering if the peppermint oil is edible, because some people seem to think its toxic. I have never thought to eat it. I don’t think I would suggest eating it. Why would you want to? I’ve never heard that peppermint oil was toxic? I would read the label of your oils to determine that. There are many different brands. The store is out of peppermint essence – can I substitute pure peppermint extract? Perfect product!! I love it for myself and it is easy to make and give to friends! How does the coconut oil work in this one? Does it solidify? What size jar should I use for this scrub? I would use the 4 oz or 6 oz. Oh, and I like to use the wide mouth jars too. Great ideas for meaningful Christmas gifts!